Have you ever forgotten where you put a favorite recipe? Digital recipe apps and websites like Pinterest are making it easier than ever to find, save, and sort your favorite dishes now, to access later from your phone, tablet, or PC. All you need to do is choose the one that’s right for your lifestyle. Some will even help you tame the pile of note cards, ripped magazine pages, and scraps of paper with handwritten recipes that are cluttering the kitchen drawer. Vibrant pictures and unlimited recipe sources make Pinterest a great organizational tool. Users simply pin the picture and original website URL to their board of choice. TIP: Before you start pinning with reckless abandon, take a moment to categorize boards so you don’t wind up with a digital junk drawer. Common board names might be, “Breakfast,” “Lunch,” “Dinner,” “Dessert,” and “Holiday” but it’s your Pinterest so if you want boards titled, “Healthy things I have to eat” and “Cookies to impress my mother-in-law,” go right ahead. You do you. Evernote is the free cross-platform app designed for note-taking and organizing. Have you ever found yourself in the grocery store thinking, “I really wish I had that great guacamole recipe Brandi gave me at the party where Matt did the terrible impression of Robert DeNiro?” Of course. We’ve all been there. If the recipe is at home in a drawer, you’ll never know Brandi’s special guacamole ingredient is green tomatillos. In Evernote, you can add recipes, notes (Brandi’s Guacamole) and even key words to help you locate precisely what you need when you need it. A simplistic approach that still earns high marks for recipe organization. The lowest tech of our high tech tools, recipes are pasted or typed in to user-friendly Google docs (similar to Word). 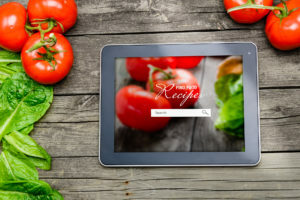 Users enjoy the ease of recipe creation and the ability to add an abundant of personalized content including nutritional information and ongoing ingredient tweaks. Recipes can be shared or easily sent to other Google users. Available for iOS and Android, Paprika Recipe Manager is a foodie favorite. In addition to organizing recipes from various URLs and scraps of paper, Paprika can create shopping lists and even organize food by aisle. Use the Interactive Recipes feature to cross off ingredients as you cook, then tap to highlight the next step in the process. Other useful tools include monthly meal planning, auto-scaling for serving sizes, and smart grocery lists that combine similar ingredients. Note – Paprika does charge a small fee for each version (Windows, Kindle, Android) but cloud syncing is free. Started by a software pro who also loves to cook, BigOven is the recipe app that gets social. Available for purchase (basic version is free) on all major platforms, BigOven allows users to follow friends and favorite food bloggers. See what fellow food lovers are cooking and get inspiration from the community. Use the “recipe clipper” to quickly snag any URL across the web, type recipes directly into the app, copy from text, or take a picture and scan. PLUS, BigOven comes with over 350,000 recipes! No matter what option you choose, you’ll need to invest some time to get the initial organization down. Once you do, you’ll be able to access new and tried-and-true recipes from home and on the go!